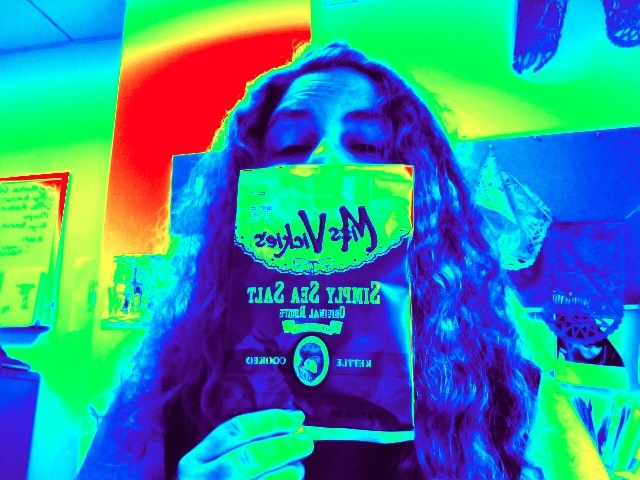 Self portrait with potato chip bag. Yesterday I didn’t pack lunch. Instead of grabbing a salad, I ordered a tuna sandwich — more calories but less garbage in the form of plastic containers. I didn’t think about whether or not the tuna they were mixing up was dolphin safe, (but if you are interested Earth Island has an updated list of which brands are). I was mostly thinking comfort food. I ate so many tuna sandwiches when I was a kid, I developed an allergy to tuna in my teens. As I was checking out, I was swayed by the lovely display of overpriced potato chips sitting by the cash register. There’s nothing I love more with a tuna sandwich than potato chips. Before I knew it, I had bought them. After the sandwich was eaten, the last deliciously greasy chip demolished and the crumbs swept into my work garbage, I stared at the bag. I couldn’t just throw it away. When I held it, I could tell it was never going to decompose — I could feel it in my bones. I wasn’t excited to find out that they my little slip sent a dollar vote both to both the food corporate giant Frito Lays and to Mobile. Plus, the bag is probably a petroleum-based innovation. Ok. So know I’m stuck with my bag. It’s pretty durable. I could probably use it to hold other stuff. (Not that I need another bag like that). Another option is Terracycle takes Frito Lay chip bags — I’m checking to see if they’ll take this brand. Not sure on that either. If you can’t beat it, wear it? Meanwhile I found this fun art project for making a bracelet out of potato chip bags. They said it was a kind of recycling — which I guess it is. The kids would probably like it. One of the sites said not to use the fun size, maybe I can make a ring? Maybe, but until I know exactly what that Miss Vickie’s bag is made of, I’m not sure I’d pop it in the oven with my kids watching.